I’ve been a huge fan of Martin Amis’s writing ever since I discovered him and read his back catalog in the 1990s. What I love about his work is that he never pulls back from his self-loathing instincts. More than any other novelist, he describes in minute detail the horrors of inhabiting human flesh, and even his youthful novels are obsessed with documenting bodily corruption and decay. The Pregnant Widow is unfortunately a disappointment. Amis pulls back on the self-loathing, and he shies away from the horrors of the flesh. Perhaps this was inevitable, given the setting for the book (1970), the fact that the main characters are all in their 20s, and that the male protagonist Keith Nearing is once again only a lightly disguised version of the now 60-ish Martin Amis, and the middle-aged and elderly tend to romanticize youth. This is the way it goes. In your mid-forties you have your first crisis of mortality (death will not ignore me); and ten years later you have your first crisis of age (my body whispers that death is already intrigued by me). But something very interesting happens to you in between. This tracks with something Rad Readr, an old friend, warned me about a few years ago as I was staring down the barrel of 40: “No one gets out of the 40s without a major crisis.” So far, I’d have to say that he’s right. Here are the crises that my friends have faced in their 40s: breast cancer, marital trouble, divorce, professional disappointment, prolonged unemployment. This is just a random sample, but you get the picture. As far as a novel about the sexual revolution, it’s clear that Amis published that book in 1973 in media res. 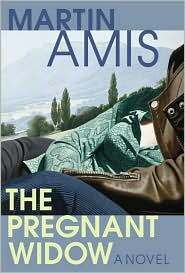 If you want to read an Amis novel about the early 1970s, read his first novel The Rachel Papers, and skip The Pregnant Widow. High-five on The Rachel Papers! One of my ten favorite novels. The rest of the Amis corpus, meh. Wish someone would gather the nuggets worth reading from each novel, the way you just did with this one–we could skip the rest. The Pregnant Widow sounds especially stinkeroo. Try The Information LadyProf, if you haven’t already. It got a lot of buzz back in the day, and I for one thought it was worth it. I really like that quote about your 40s and 50s. My impression–and I’m hoping this is correct–is that I already got my 40s crisis over with when I was 41. @CPP: Do you figure if I have my “40s crisis” when I’m 37-38 it will count? CPP and John, I hope you’re done with the 40s crises early. Me, I’m still waiting to see when my number will come up. John S: Big secret they don’t tell you; you can do it at any time. One to a customer. I went @ c. 33-34/5. In by 11, out by four… Although I don’t know about that “undiscovered continent” part, but I was thinking about something like that just this morning, in other language. Martin Amis’ earlier essay are my favorite. Generally, I have some difficulties with English literature. Tried Howard Jacobson recently and despite the praise, couldn’t go on for more than 50 pages. Crises, old age, 40s: I am an old guy (Medicare), you have disappointments (probably once a week), but there really is no room for complaint; we are fortunate – employed, travel, do decent work, etc. What crisis? The key to enjoying Martin Amis is that only every other book is worth reading: Rachel Papers good, Dead Babies bad, Success good, Other People bad, Money good, Einstein’s Monsters bad, London Fields good, Time’s Arrow bad, The Information good, and then they all turn bad as far as I can tell. Joshua: OMG! Brilliant. You’ve cracked the code. My faves are your faves, although I thought that Time’s Arrow was an interesting experiment. I just wonder whether/how Amis’s thoughts on age are gendered. As a fifty+ woman, I find myself feeling on the edge of possibility. The richness of my life is not because of the past, particularly, but because of what I’ve learned in the past that I can use in the present. And while there are particular things in my life that support this, many of my contemporaries feel something similar. It’s not just me. I’ve known quite a few women who in their 50s and 60s were at their most creative. FWIW, my experience is that events are not always crises, if that makes any sense. In middle age, bad things will happen: you or people you care about will get sick; relationships will change; jobs disappear, cease to be satisfying, or whatever. Some of these things for me have been felt as a crisis – what now? – but others are just things I’ve dealt with.